Mystic of Holyhead (successor to Lynn Rival) - All aboard that train . . . Title: All aboard that train . . .
We took the train south to Marrakesh. By this time we were used to getting by with a mix of our very limited Arabic (which we brushed up a bit in Somalia) and French. The journey was almost 5 hours but the trains are modern and comfortable. Arriving in Marrakesh we were predictably ripped off by our taxi driver who dumped us some way from our hotel ( a riad - converted town house with atrium), which was close to the main square (Jama'a al Fna). We managed to walk the last few hundred yards, ignoring the would-be guides wanting to charge us for the privilege of telling us where it was. Fortunately, the riad was very comfortable. We spent the next day ambling around the medina, soaking up the atmosphere and avoiding buying carpets or other impractical souvenirs. In the evening we ate at one of the food stalls in the square, not sure what part of the sheep's anatomy we were consuming, most likely the cheeks, but it was delicious. One day was enough. The medina is a fascinating maze of streets and alleys, all paved and tidy but very busy with tourists and polluted by scooters. We were ready to head out into the countryside. We had been impressed by the infrastructure in Rabat and Sale: good roads, pavements, electricity and water services, and rubbish collection. Here too we were pleasantly surprised by the quality of the roads. And, driving through remote areas we always saw electricity pylons and water mains. The towns are clean and countryside tidy. Yes, they do have a growing problem with windblown plastic bags and bottles but thankfully you don't see wrecked cars, old fridges and abandoned agricultural equipment left to rot. We saw a lot of new housing being built but very little industrial development. We did see the occasional tractor but much of the cultivation is still done with mules and hand tools. 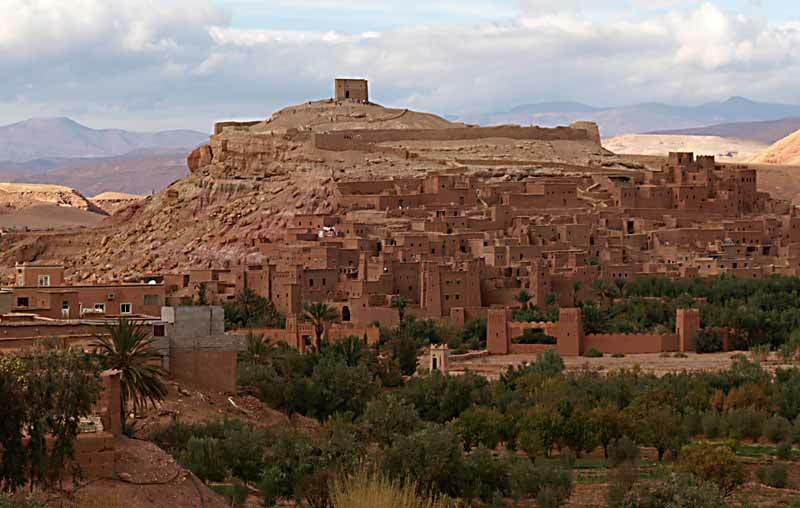 Ait Benhaddou - an 11th century kasbah. The fortified gate in the centre foreground is actually . 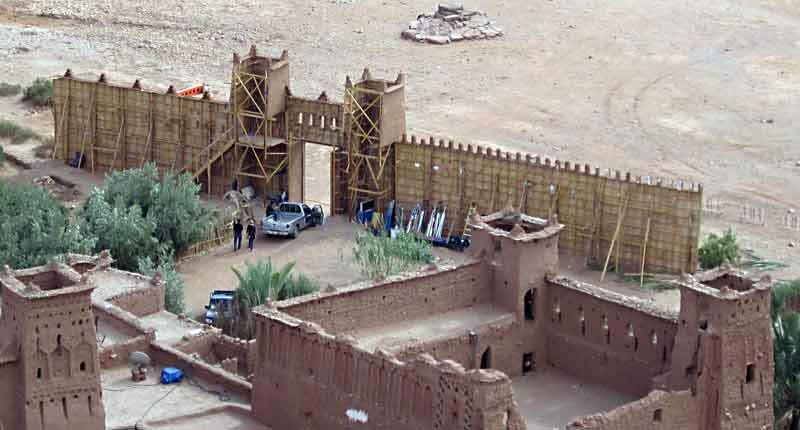 . .
a set for filming "Jesus of Nazareth"
After the first morning, our driver, Rashid, soon got used to our tastes. 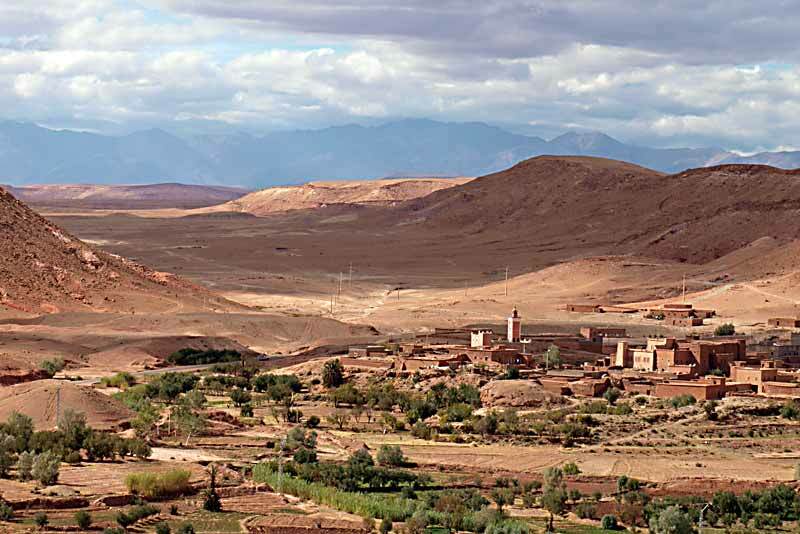 We enjoyed the walk up to the top of the rebuilt kasbah at Ait Benhaddou but were not interested in stopping to take photos of the film studios at Ouarzazate. We then spent the night in a hotel close to the Dades gorge, one of the spectacular sights in this part of the mountains. 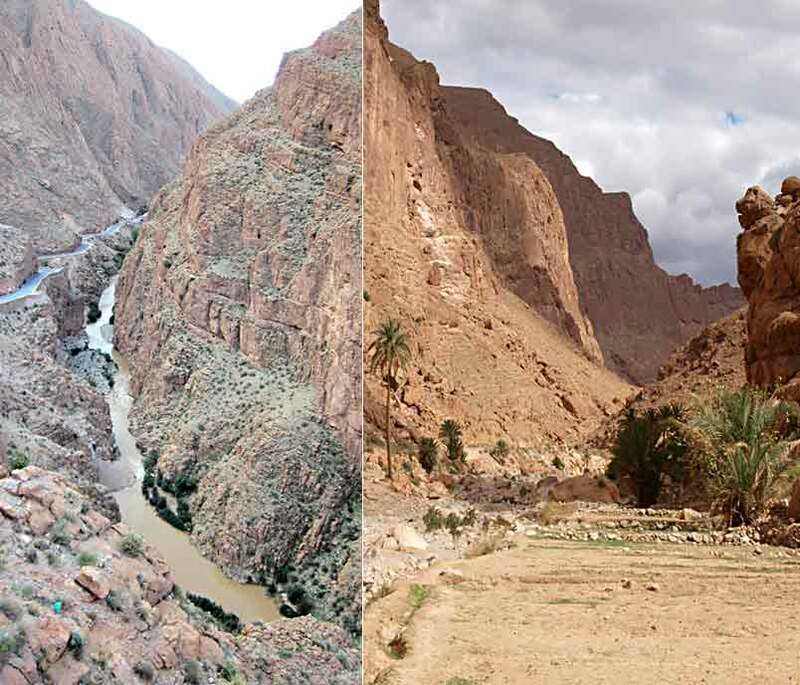 On the second day we made our way east, visiting another gorge and passing through valleys mostly planted with date palms but including one where they grow roses for making rose water, oil and other products. Villages and housing run the length of the valleys, sometimes perched precariously on the hillsides. 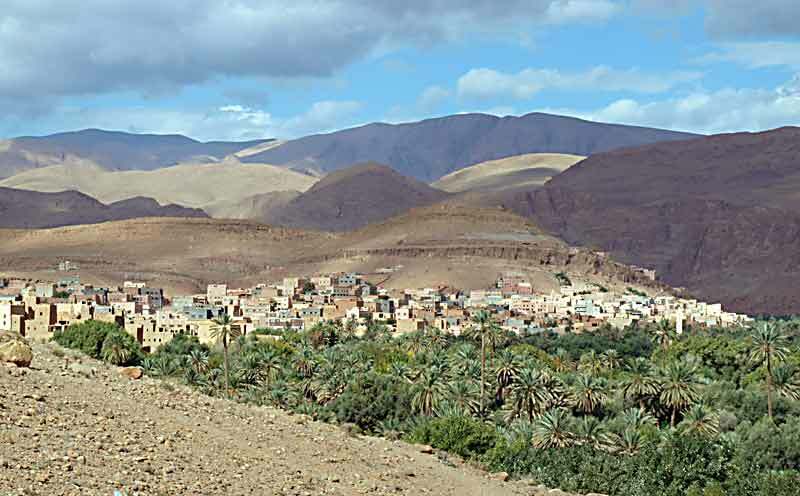 Rashid was keen to explain that this area is populated by Berber people and they are very proud of their ancient heritage. They are also very enterprising. When we stopped to take photos Rashid would try and park away from the tourist traps but someone would always pop up out of nowhere trying to sell us a souvenir. In between the valleys the terrain is stony scrub or desert. Eventually we reached Rissani, "gateway to the desert" and Rashid's home town. We had a late lunch of what he described as pizza Berba, organised for us by his brother, Mohamed and eaten in a local cafe where families were having the same thing for Sunday lunch. It's a round shallow pie of bread crust with meat, egg, almonds, vegetables, herbs and spices inside - and absolutely delicious. As ever, it was washed down with Moroccan tea (made with green tea and fresh mint) which we've become used to drinking here. 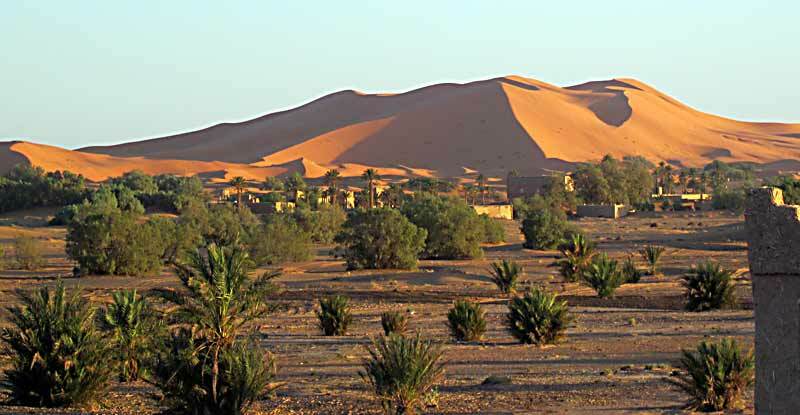 Rashid drove us on to Merzouga, close to the famous Erg Chebbi sand dunes, for a night in a kasbah style hotel, complete with swimming pool. Despite it now being high season, we seemed to be the only ones there. Funnily enough we declined the camel ride into the desert at dawn. We had an excellent evening meal and the best Moroccan breakfast yet, including egg-fried bread, though we're still not sure about the chewy pancakes. 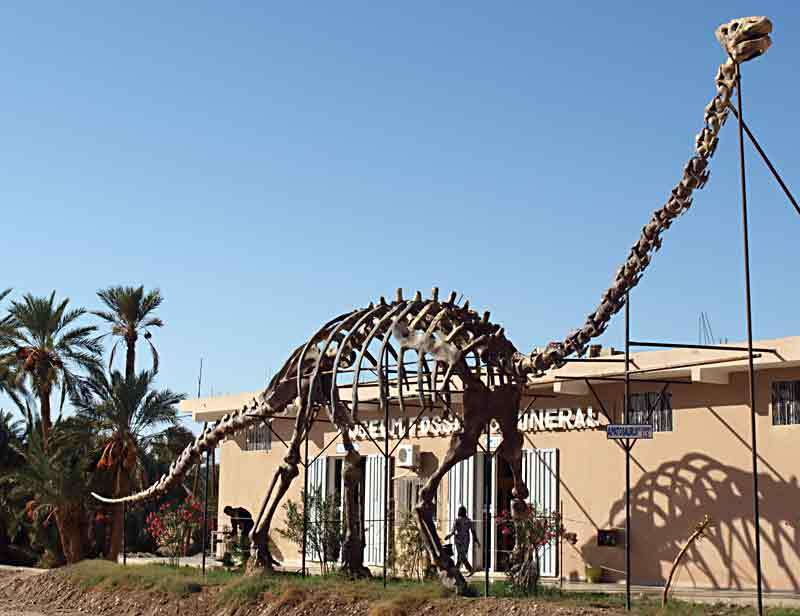 From Merzouga we headed north to Fez, stopping briefly at one of the highlights of our tour: the fossil museum near Erfoud. Well, what would you put outside your fossil factory? 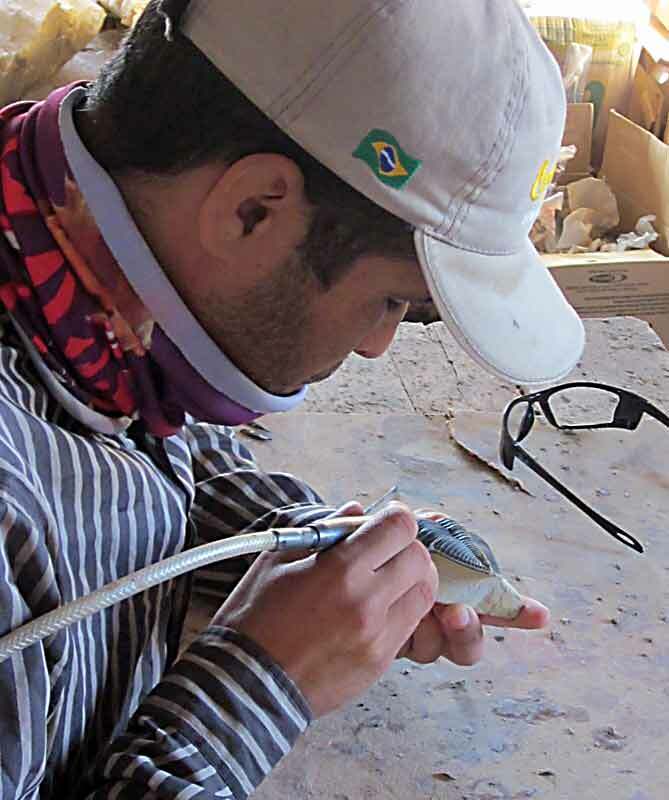 Not only do they have an interesting display of fossils found in central Morocco but also workshops where they laboriously extract the fossils from the rock. 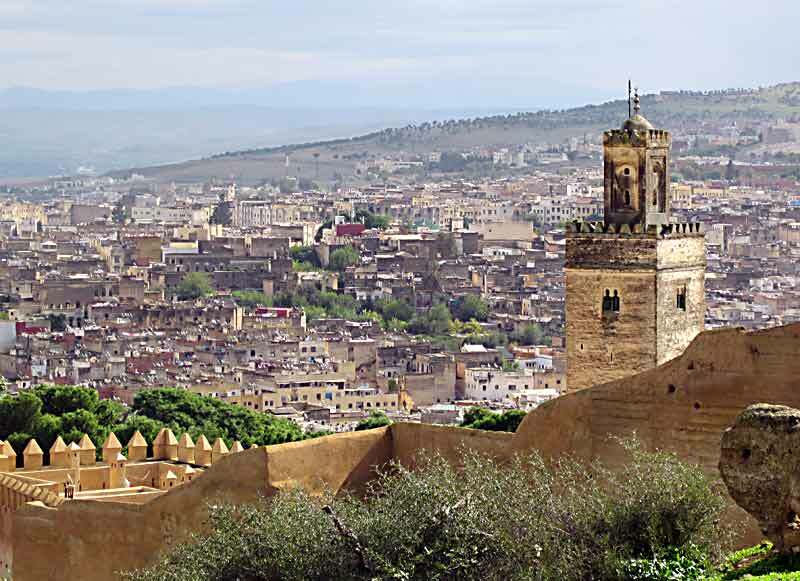 As we approached Fez the valleys were increasingly greener and more fertile. It was a long drive, arriving after dark. We'd booked in a riad just inside the old city walls. Fez is renowned for being tricky to navigate in and Rashid had to ask the way many times. Our hotel receptionist came to meet us at a prominent landmark and then guided us for the last mile. After saying goodbye to Rashid we set out to find somewhere for supper (with a map from the receptionist) and managed to find our way there and back. The hotel staff were all a bit surprised we didn't want a guide but we soon got our bearings and during daylight it was much easier. We explored the souqs and some of the sights, liking Fez a lot more than Marrakesh. The steep hills add character and the alleys were not blighted by scooters, you only have to watch out for mules and carts, apart from other pedestrians. After a second night in Fez we caught the train back to Sale, having just scratched the surface but happy to have seen a bit of Morocco. 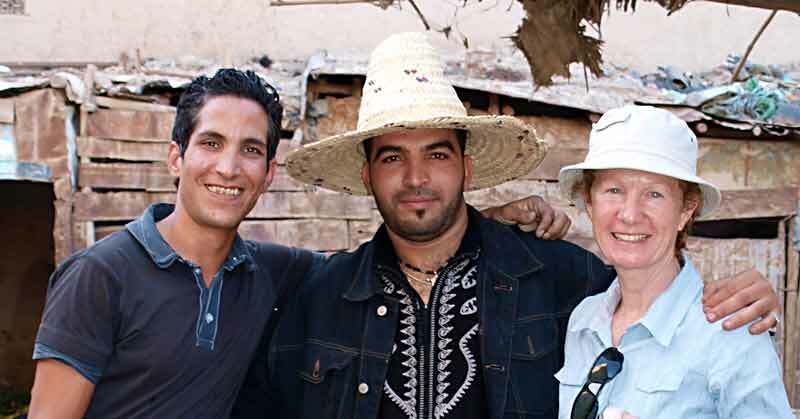 Oops, nearly forgot - we did do the souks . 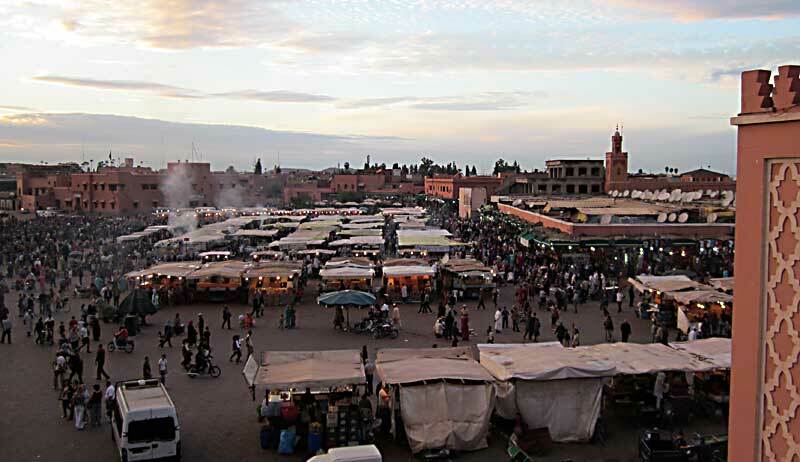 . .
Marrakech was technologically advanced - but they also have a snail souk! 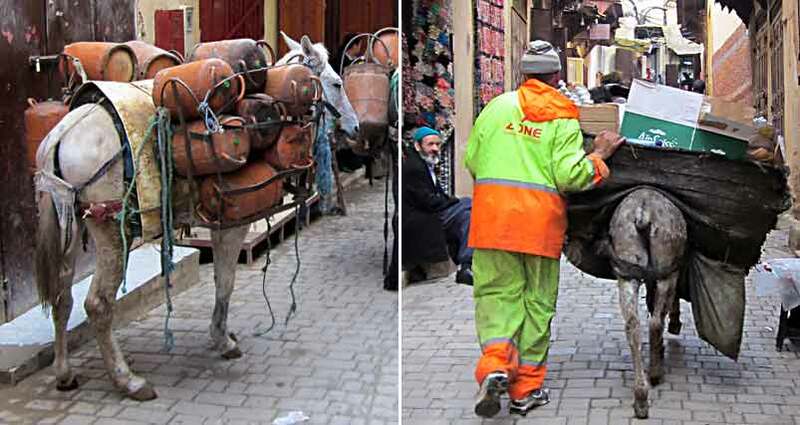 The gas man cometh, in Fez, and the waste contractor - 'Ozone' does a good job.